of mobile devices in the enterprise. The last 18 months has witnessed a barrage of smart phones and tablets coming onto the market. While these devices score high marks for being “cool” I can honestly say, the INFOSEC pessimist in me says “Malware Vector” and the enterprise solutions person in me says I can put enterprise applications in the hands of key C-Level decision makers regardless of where they are. If deployed securely, mobile devices and smart phones could be the culminating of business agility we have all been working toward for years. Unfortunately, information security groups are rubbing their temples in the wake of a recent, and rather embarrassing, security breach with Apple’s iPAD product. A few weeks ago I bought a Chinese knock-off android tablet, after receiving it I connected it to my wireless network, brought up my Syslog server to watch PIX logs and within ten minutes, it was phoning home to a site in Japan! (I knew it!) We have also had stories of some of these smart phones being shipped with malware before they are ever handed to the end users. In many organizations, prior to connecting to your network remotely, you are forced to undergo rigorous endpoint analysis to ensure that you have a proper and updated virus signature, a host based firewall, an approved build, encryption software, etc. Many INFOSEC groups kicked and fought for these policies in what has been described to me by my colleagues as just short of a bloodbath. For some IT shops, the blood of the remote access policy fight hasn’t even dried yet and if smart phone vendors think that enterprises will abandoned these polices to accommodate these devices they are delusional. At the same time, securing a smart phone may strip it down to the point that it is really no more valuable than the cell phone they have today. 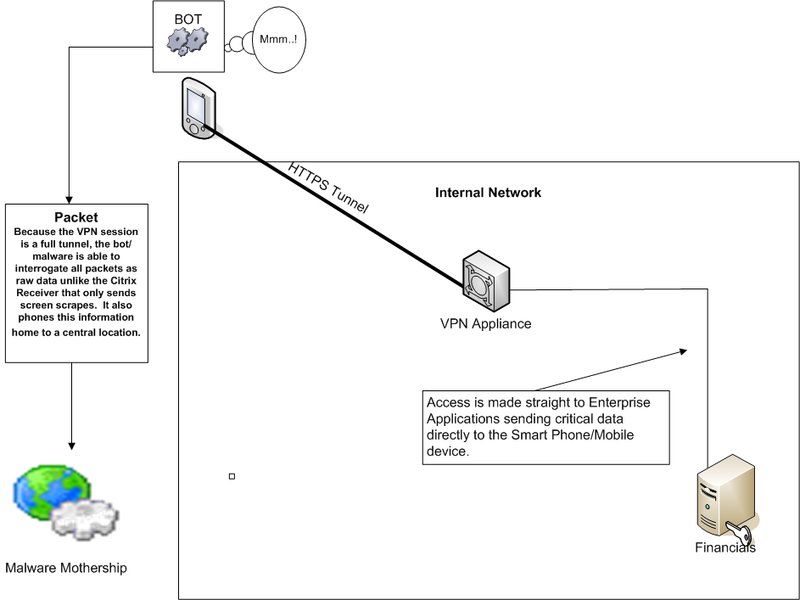 I read the other day that Juniper is making a VPN client for Smart Phones. While I agree that Juniper VPN is a good product, I think it is risky to grant a VPN tunnel to any of these appliances. Why would a PC have to pass an endpoint scan and a smart phone not? Are they going to build smart phone endpoint scanners/agents? John, if you are so down on smart phones, why do you want to support them? In our world, the end users do not exist because of us, we exist because of them. The title of this blog post was called “Extending the Rudder” and what I mean by that is that key decision makers in a company cannot be given too much agility. I am quite certain that Larry Ellison is not the CEO of oracle because he is the world’s best DBA. He is in that position because of his ability to steer the company and make critical decisions. Decisions are made through key metrics that are delivered to them via briefings, emails, etc. There is never too many ways to make this information available so long as you can keep it secure. The mobile platform introduces the ability to take business agility to the next level and effectively “extend the rudder” to C-level and/or key decision makers in any organization. This goes beyond helping them look cool on the golf course. Products like SoftwareFX can deliver business intelligence reporting that is custom fit for a particular smart phone or device. The ability to deliver key metrics or enterprise applications to mobile users will make your organization more nimble AND look cool on the golf course. Guess what, if there is a breach of corporate information on an iPAD issued by your company or agency, or you granted access to enterprise applications to an personally owned iPAD, it’s your responsibility. While Apple has restricted the use of middleware on its iPhone/iPAD applications, the other smart phone vendors may not. At issue here is the willingness to open up the OS on these devices to middleware while at the same time protecting the user and themselves from breaches. I know that Apple has taken a lot of flak for its policies on middleware and there is a big push to get them to back off on it. Either way, so long as these moving parts exists, there is a possible vector for malware, breaches and all around jackassery. There have also been concerns about the security of the Safari browser and opening up your ERP to a mobile device could mean exposing your infrastructure to an OS that currently has no enterprise virus scanning software and, in some cases, has applications installed on it that may carry malware themselves. So how does thin computing get around this? While I expect a lot of INFOSEC and IT Departments are going to say “No” when it comes to permitting the use of smart phones. I believe through thin computing via Citrix receiver and XenAPP or XenDesktop you can easily deliver safe and secure enterprise applications that will not run on the smart phone at all but rather on a locked down XenAPP Server or XenDesktop environment that only sends screen refreshes instead of full session traffic that can be sniffed or interpreted by a bot or malware. I think this product is fantastic and shows how organizations are going to have to ready themselves to securely deliver enterprise applications to mobile devices. In this scenario, the users email contacts and personally identifiable information exist on the exchange server and on the XenApp client that is run out of an ICA session. If the phone is lost, stolen, damaged or hacked, the information available on it is of no use as the crown jewels remain safe on the enterprises servers. Two factor authentication that is supported by the Citrix receiver and regular password reset regimen will help secure the end users credentials. All of these factors will allow systems administrators and INFOSEC types to have the freedom to innovate with this new technology. The drawing below is an example of a VPN tunnel into an internal Network. In most cases, VPN appliances are installed with an “any any” rule allowing the clients to connect anywhere in the organization once the log in. 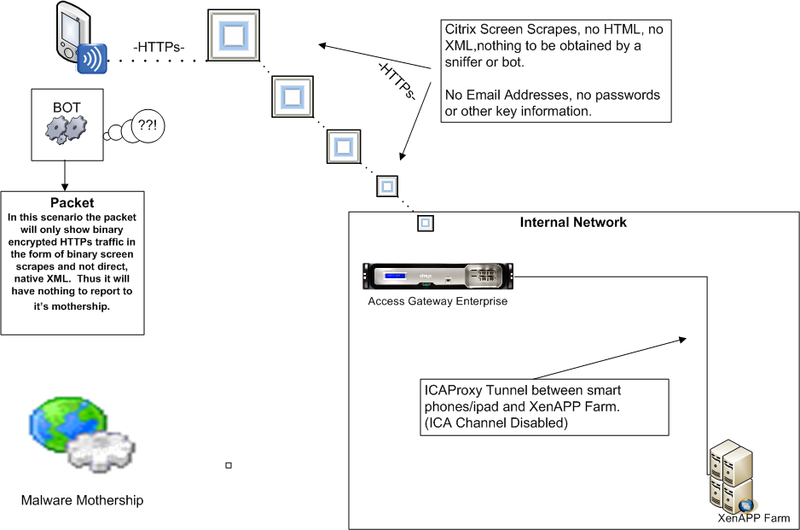 In this drawing we see how using the Citrix receiver is not a full VPN tunnel but an ICA Session that sends encrypted pixel refreshes to the end user instead of raw data. This means that if there is a zeus bot, or the like, on the phone looking for key html or xml such as “password” or “Card Number” it will not appear because the only data coming across is screen refreshes. This effectively keeps the data running on a restricted environment via XenAPP or XenDesktop. It appears as though the next technological line in the sand will be these mobile devices. The coming battle for superiority in this space will likely involve small OSes such as the Mac BSD hybrid OS and the Linux hybrid(s) that is on a lot of the ‘Droid series phones. These are very streamlined distro’s that you will not simply be able to install a complex anti-virus suit like McAfee or Symantec. Also, I believe that the prevalence of these devices will only grow and they are upon us as Sys Admins whether we like it or not. As Citrix is basically present in nearly every large company, Citrix receiver, coupled with Access Gateway and SoftwareFX could put you and your team in a position to be able to accommodate this level of agility. Ensure that your INFOSEC teams understand the difference between an ICA Session and a VPN Tunnel, begin to educate decision makers on why we can make use of this technology for end users who are in the field and need this level of agility. Put yourself in a position to say yes, as it doesn’t take a great deal of innovation to say “no”. God knows, I am hardly the gadget enthusiast, in fact I remember telling people that a phone was for talking on and nothing more but this new breed of smart phone and affordable tablets has me excited to see what we can do for our users in the field who, ultimately, pay all of our salaries.